Does our Tony know you? No, I’m at Harrogate Grammar School and Tony isn’t, so I don’t know him, but I heard he has the new Beatles record and I’d like to hear it, please. What’s that name again young un? John, er some people call me Fred. Tony! She shouted indoors whilst continuing to guard the door, Tony, there’s some lad your age at the door. Says he likes The Beatles. Tony was at his front door in seconds. I’d say in his rush he managed it in about minus two of our Earthly seconds. The door opened wide with one urgent, decisive pull. You like the Beatles then? Big smiles from both of us. Making friends took us about six words and two smiles. No time had passed during any of this. I heard you had the new Beatles record. My Dad wont let me buy it! Who needed to say more than that to a fellow Beatles fan? Come in then! Come on and listen to it with me. Then he uttered a magic incantation. “Its a double A-side”. More mysteries from The Beatles. Both sides are as good as each other. That’s impossible! How do you turn the record over if it’s got two A-sides then? Tony laughed at my naivety. But then I only owned two records. Well half of two records. Only one of which was any good. My qualifications as an arbiter of taste concerning music extended to one half decent record; mostly guitar with good drums and no lyrics. Didn’t really make me a good judge of Beatles songs and records. Tony was a great judge of Beatles records, not least because, as it turned out, he had all of them. Soon he was to become the epitome of cool amongst ALL of the twelve and thirteen year-olds in Gordon Avenue, Bilton and the neighbouring streets; all eight of us in fact. Tony was that cool. OK! I’m going to play you a song and you have to tell me what it is. No, No! Please play From Me To You, I can’t hear it at home at all, except on Pick of the Pops. Thank heavens it’s been number one for weeks. What about Saturday Club? 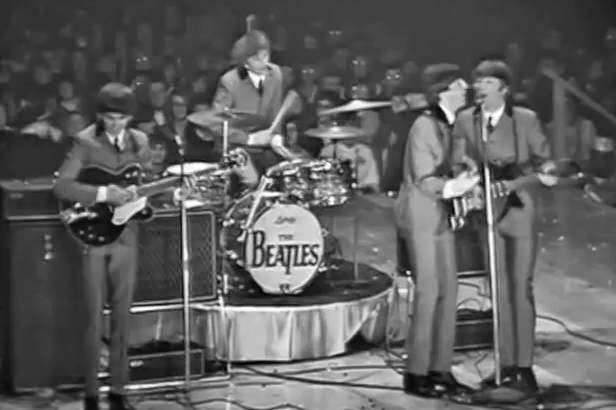 Brian Matthews plays the Beatles. Oh yeah we listen to that sometimes; when we don’t go shopping or play football. But it’s on Saturday mornings, when we’re busy. Do you think it’s good then? It’s really good! I listen to it all the time. Obviously great then I thought. I made a note to try harder on Saturday mornings from now on. Tony took the treasured single out of the soon to become iconic dark green Parlophone paper sleeve. It was the first time I had seen a Beatles single; holy plastic made flesh. As it’s a double A-side I could play Thank You Girl. I didn’t realise he was teasing me. He could see how desperate I was to hear From Me To You. How can it be better? From Me To You is the hit. Its a double A-side, you have to make your mind up which one you like. Then I’ll like both of them just the same. Big smiles between us. We didn’t need any analysis to know that Beatles songs were great. Tony had the classic Dansette record player. In red! We didn’t. Just Mum’s Philips that we had driven back with us from Germany. It was a good enough record player; I didn’t realise how good in fact, but it wasn’t cool like Tony’s Dansette. And we were in the Front Room. Tony’s Mum hadn’t said a word when he had dragged me into the Front Room. It had a bunch of records and the Dansette lying on the floor. He’d taken over their Front Room to play his records! So he was playing his Beatles records anyway before I arrived. I was just adding to the fun he was already having all on his own. Unlike me back at home. I had been right to come round. The lyrics are great aren’t they? Just call on me and I’ll send it along with love from me to you. Oh yeah like I did! How funny… I hope you don’t mind? Are you joking! It’s fab you coming round. What made you call on me anyway? I smiled back at my fellow Beatles fan. Our instant friendship was the best answer to that question. Well I heard you had the new Beatles single and I just had to hear it. So I thought I’d come and ask you. You had to be nice, if you liked the Beatles. Tony laughed. I’m not sure that makes me nice, but I definitely like the Beatles. They are the best thing I’ve ever heard. I think I’d like to kiss a girl. Have you ever kissed a girl? No girls. Girls smell nice. And they are nice to hold. The conversation was getting a bit complicated for me. And far too sophisticated; I was out of my depth here. I regretted mentioning kisses. I’d only kissed that Italian girl Anna in Germany when I was six. And only because she had tricked me into going down the cellar stairs with her on her sixth birthday. I didn’t want to be tricked into talking about that, so I concentrated on the sophisticated complications of the lyrics instead. There is that magic harmonica again! I love the way they use harmonica. That’s the secret to Please Please Me you know. We smiled again at the reference about me calling on Tony. So who is your favourite Beatle then? Paul of course, he’s the best. Why do you like Paul? Well he’s the best looking. He’s even better looking than Cliff. At this point I’d spent more time looking at pictures of The Beatles than actually listening to them, which was partly why I’d invited myself over to Tony’s. My Mum likes him the best too. I bet he gets loads of girls. Do you like Cliff then? Yeah and the Shadows! My brother and I like guitars and drums. And The Beatles are really good at guitars and drums. And harmonica too! They play so many instruments. The Beatles are the first beat group I’ve really liked. I think I like them just because they are The Beatles. Who’s your favourite then? John Lennon? Why? What’s so special about John Lennon? My Dad hates him. Well I am pretty sure he does. Tony laughed again. I frowned, what was wrong with Paul McCartney? Sometimes this Pop Music was even harder than Biology. Well John Lennon has loads of confidence. That’s the secret of life you know; Confidence. That’s the two of them harmonising. That’s another of their secrets. But John’s voice is harsher. Paul’s is really sweet and he sings nicer. It’s both of them singing together, that’s what makes the Beatles special. Its not just Cliff or Elvis with some backing singers. Its all the Beatles, as a group, working together. Listen to it carefully. He was right! Their voices dropped in and out in various ways that emphasised almost every syllable in a different way. You could hear John and Paul both together and alone throughout the record. Blimey, such subtlety; no longer just a simple lead singer to worship and adore. Do you think we could become Beatles too? We’ll need guitars and drums. And a harmonica! We laughed at the complexity of it all. My brothers got a guitar, he likes Hank Marvin. Oh, good! What about drums? Um, well I’m a drummer. Have you got any drums? Oh yes I’ve got drums. Not real ones though. Not real drums? What does that mean? Um, biscuit tins. I’ve got two biscuit tins. But I know how to hit them properly! Tony laughed. Again! The record ended, cleverly reprising the opening whilst changing it into punctuation. Can I look at it please Tony? Yeah, here have a good look. The label design is really interesting. How long have you liked the Beatles then? Since I first heard them silly! What since Love Me Do? No! Please Please Me, of course. Their first hit record and and their first number one. Love Me Do was their first hit record. Tony corrected my ignorance. Love Me Do? What’s Love Me Do? Their first hit record. I thought you liked the Beatles!? I love them, but I’ve never heard of Love Me Do. I’ve got to play it for you then. Its their first record, its great. Is it as good as Please Please Me? Not really. But if you heard it first, like me, then it’s really special. Oh! What’s this Northern Songs on the label? Only their publishing company; wait a second what about this instead? Blimey that’s good! What is it? I Saw Her Standing There. It’s from the album. You’ve got the The Beatles Album! The only albums we’ve got at home are The Pyjama Game and South Pacific. How on earth did you get it? I’d never known anyone who wasn’t a grown up own an album before, not even Caroline. I was in awe of Tony from that day forth. He played me loads of Beatles songs over the next hour before I had to go home for supper. I’d never heard so much good music in my life before. Gordon Avenue suddenly had its own oracle of all things Beatle. I knew then that I only had to like The Beatles for everything to be alright in the future.